Is telecommuting limiting to the civil engineering professional? A couple of weeks ago a consulting civil engineering client of mine offered an opportunity to an extremely talented candidate that would have allowed him to work from home for his first 6-8 months in order to accommodate some special circumstances. The candidate ended up delaying the acceptance of the offer until the first quarter of next year as his situation would be fully resolved (hopefully the opportunity will still be available). The details of the circumstances are neither here nor there, but at the end of the day this candidate determined that as flattered as he was that they would make special accommodations for him, he would not feel comfortable in a work-from-home situation as he would be “out of the mix.” He is a team player and not having immediate access to his team, and the “perception” that he would not be giving 110% because of his physical absence he saw as a detriment. Interestingly enough, I recently read an article on the Harvard Business Review website titled, Why Remote Workers Are More (Yes, More) Engaged, by Scott Edinger. 1. Proximity Breeds Complacency – that is, leaders who work in the same building, let alone the same floor, regularly fail to interact face-to-face with their employees, preferring rather to communicate via email. 2. Absence Makes People Try Harder to Connect – that is, leaders are more deliberate in their communication with those off-site employees. 3. Leaders of Virtual Teams Make a Better Use of Tools – that is, leaders are forced to use video-conferencing, instant messaging, and even the telephone, just to name a few; an advantage that their peers may not necessarily take advantage of by having everyone working in the office. 4. Leaders of Far-Flung Teams Maximize the Time their Teams Spend Together – that is, since the time the team actually spends together on location is limited, when they do get together the level of focused attention is higher than it might be otherwise. 1. Knowing the determination and intelligence of the candidate, he could have successfully handled the situation. But he felt that, especially with a new employer, he did not want to be perceived as a slacker. Even though he would have given 110%, his absence from the office could easily be mis-construed. 2. Part of his motivation for exploring a new opportunity was because in his current role, he lacked mentorship. Working from home for at least six months would limit the mentoring opportunities available to him. 4. Out of sight, out of mind. Enough said. Unless you are a regional or national business development executive who is jet-setting all week, or a technical engineer who is completely satisfied with maintaining a long-term technical engineering role with no real advancement, you are better off working at the office as opposed to remotely from home. 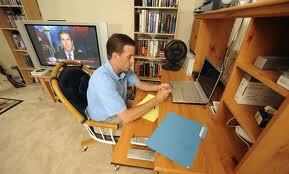 Does your firm allow for work-at-home opportunities on a regular basis? Have you been part of a positive work-from-home experience? Have you seen people fail in work-at-home situations with their employers? I look forward to hearing you share your thoughts and experiences on this topic as a civil engineer. Entry filed under: Business Development, Career Development, Civil Engineering, Civil Engineering Issues, Civil Engineering Jobs, Employee Retention, Human Resources, Interviewing, Recruiting, The Workplace, Uncategorized. Can a Civil Engineer work from home, and be successful? It depends on the culture within the firm. If the leaders feel that it’s important to have face time, then telecommuting is not going to work at that firm. I’ve sucessfully run my own CE business from my home for the past 12 years. It’s different in my case because I’m an independent consultant and not an employee, but the positives given in the HBR article do bear out, in my experience; we at-home people try harder to connect to our design teams. Also there is not a lot of office chatter/noise/distraction to keep us from working – sometimes office conditions are a hindrance to productivity. I am a 30 year verteran, having owned his own company before the Bush crash of 2008 having taken it all. I am now working as an employee of a large company 2 days in the main office and 2 days in a remote office (alone). With delegative management techniquies, I’ve been able to manage several complex multi-disciplined infrastructure projects quite effectively. I concede that there is a dynamic of personal relationship and respect that must be established prior to being able to work efficiently from a remote loaction, but with the proper skills, it definitely is possible to manage even complex projects with great success. Good morning, and thanks for reading and sharing your thoughts. I am not saying that it can’t be done, but it takes a very crafty, dedicated, focused and talented manager to make the situation work and to allow those working remotely to be successful. They must keep the employee engaged and create those opportunities for interaction with peers. It sounds to me like you have mastered the art of managing folks remotely! Again, thanks for reading and have a great Labor Day Weekend! Great article, Matt. I notice the HBR study suggests that Leaders of virtual teams hold the key to at least half the success…I will say it’s even more. Managing “un-officed” employees takes special skill and requires a great deal of “intentionality” (dictionary says this is not a word, but I like it). If a manager is not practiced at managing remotely, there is a risk for the employee. Sorry it didn’t work out. Hey Josie – thanks for your comments. I agree with you whole-heartedly in that the manager holds more than half the key…hence my point, “out of sight, out of mind” – it takes a very skilled manager with that “intenionality” to counter that concept.